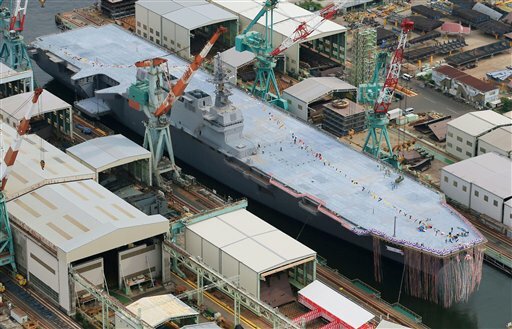 It’s Japan’s largest warship since World War II — unveiled on the 68th anniversary of the atomic bombing of Hiroshima. But it’s not a carrier. The destroyer Izumo cost $1.2 billion and goes public amid territorial clashes between China and Japan (China, for its part, appears to be always ready). Japanese officials insist the Aug. 6 unveiling was coincidental and had more to do with favorable ocean tides than World War II history, according to this AFP report. It’s an odd distinction, but not an unprecedented one: Previous, smaller flat-topped vessels were labeled “helicopter destroyers” by the Japanese. Read more about the ship, and see more photos, here. Lets see – 800+ foot flight deck (kinda like the USS America has). 45000+ ton displacement (kinda like the USS America has). Can handle F-35B (ops that is the USS America). But it is NOT a carrier. Its as big as China’s carrier, India’s carrier(s), Russia’s carrier. But it is NOT a carrier. It is a Flat destroyer.